Rich lavish Chocolate Peanut Butter Pie drizzled with chocolate ganache and sprinkled with chopped nuts. 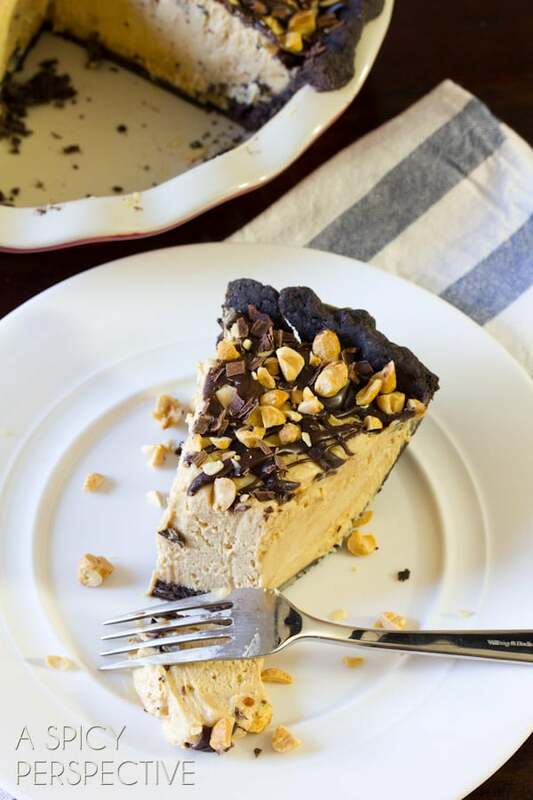 This peanut butter pie is calling your name! 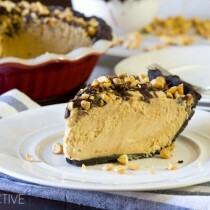 I’m currently in the middle of a scandalous love affair with peanut butter pie, and I don’t know how to get out of it. I’ve tried avoidance, focusing on other things, even cold showers. But something about the rich luxurious filling and dark chocolatey crust entangles my emotions and makes me lose all sense of right and wrong. Caught in a feverish trap of cool clouds of nutty filling and mysteriously dusky pie crust. I don’t want this pie to sway my affections and cause further remorse. Could you take it off my hands for me? I can’t seem to give it up alone. All jokes aside, this chocolate peanut butter pie is SHOCKINGLY ADDICTIVE. You really need to make it, but only when you have people coming over. 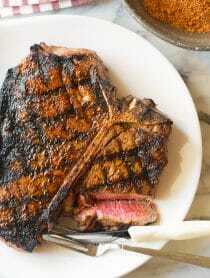 Unless you have willpower like the strength of a steel trap, you WILL eat it all. This chocolate peanut butter pie would make a fabulous final note at any holiday party this season, be it Halloween, Thanksgiving, or Christmas. Or even a just-because party. 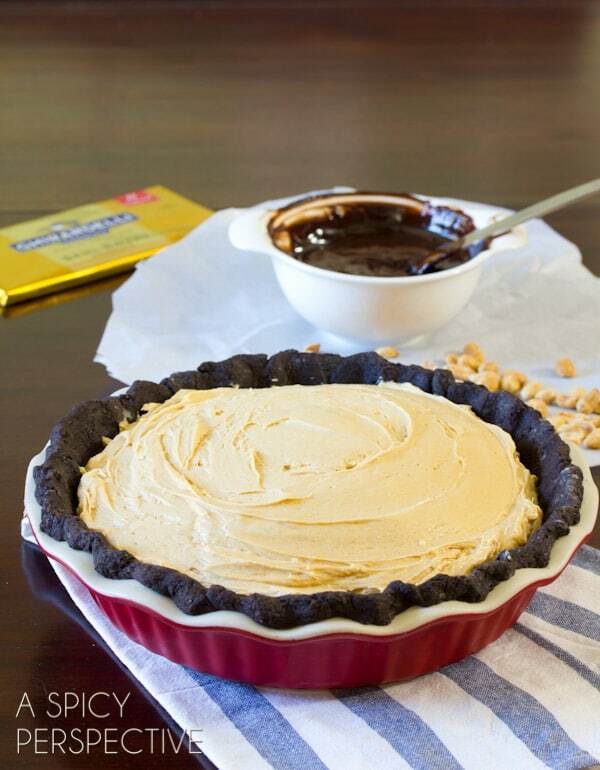 As in, I’m having a party just-because I need to make this peanut butter pie. I won’t judge, I promise. This pie is dangerously enticing! Preheat the oven to 375 degrees F and lower the rack to the lowest position. Cut the butter and shortening into cubes and place in the freezer to chill while pulling out the other ingredients. Pour the booze over ice to chill. Place the flour, cocoa powder, salt and sugar in a food processor. Add the cold butter and shortening and pulse to break up the butter into small pea-size balls. Drain the booze and add one tablespoon at a time pulsing, in between, until the dough come together. Don’t add too much liquid and don’t over mix. Dump out on a piece of plastic wrap. Wrap well and refrigerate for at least 30 minutes. Bake the pie crust for 17-20 minutes until set. 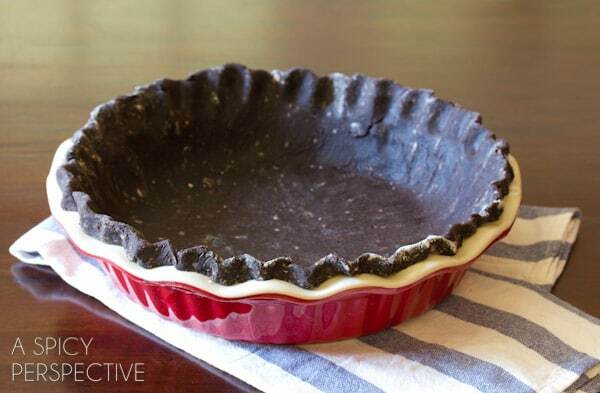 Allow the crust to cool before removing the pie weights and paper. Cool completely before filling. For the filling: Using an electric mixer whip the heavy cream into firm peaks and set aside. Using a clean bowl, beat the cream cheese until smooth then beat in the peanut butter. Scrape the bowl and slowly add the powdered sugar. Once the mixture is smooth, gently fold in the whipped cream until the texture is consistent. Scoop the pie filling into the cooled crust. Refrigerate immediately. For the Toppings: Microwave the heavy cream until scalding hot. Add the chocolate chips and allow them to sit in the hot cream for 2-3 minutes. Stir until smooth. Once the chocolate ganache cools a little, use a spoon to drizzle it over the top. Then sprinkle with peanuts. Use a veggie peeler to shave chocolate curls over the top. Chill until ready to serve. Hi Just wondering if this pie can be made ahead and frozen. It looks delicious. Maybe the crust can be made ahead and froze and rolled out later. Hi Mary Lou! Yes, just thaw in the fridge for 12-14 hours before serving. Hey Sommer, this pie looks amazing but I’m just wondering if you could use anything else besides booz for the crust? Any ideas? I used very cold water instead of the booze. Turned out just fine. I also cut mini peanut butter cups in half sprinkled on top before I did the chocolate drizzle. Then did the chocolate curls and no peanuts. I ended up getting lazy and made a different crust (a pressed cookie crust), the filling in this was delicious. I ended up only needing to use a half a recipe of the filling but it was really popular at my dinner party (and I loved it). 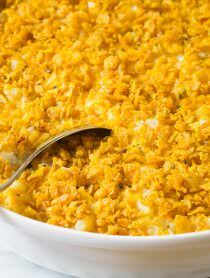 An overall great recipe! Sommer, thanks for this recipe! 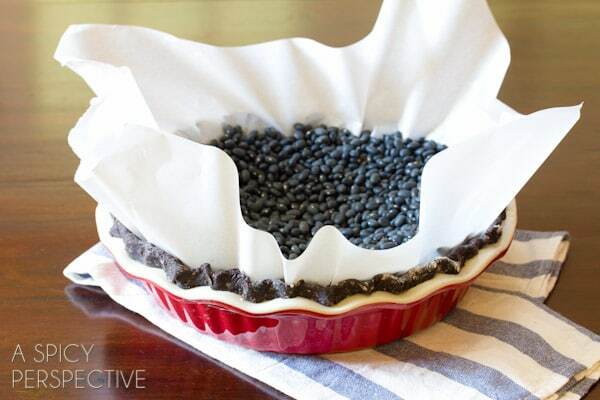 I am making it as I write… was wondering what size of a pie pan did you use? The filling sounds like large amounts so I am assuming you pie pan must be a larger one? He Pam, my pans are 9 inch dishes, but they are deeper than a metal pie pan, if that’s what you have. Thanks for the clarification… I used my regular 9 in pie plate and only made half the filling recipe. it turned out to be just the right amount. The chocolate ganache (doubled this in case anyone wanted to drizzle extra) and peanuts made this over the top good! Thanks again for the wonderful recipe. Pingback: Cranberry Walnut Vanilla Pound Cake - Chocolate Chocolate and More! This looks incredible! Love that chocolate crust! It looks so fantastic and that chocolate crust…..perfect! Saw this on pintrest. Linked it back to your page/blog. Sad someone stole your picture . 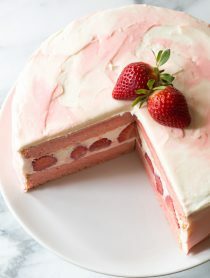 This dessert looks awesome!!! 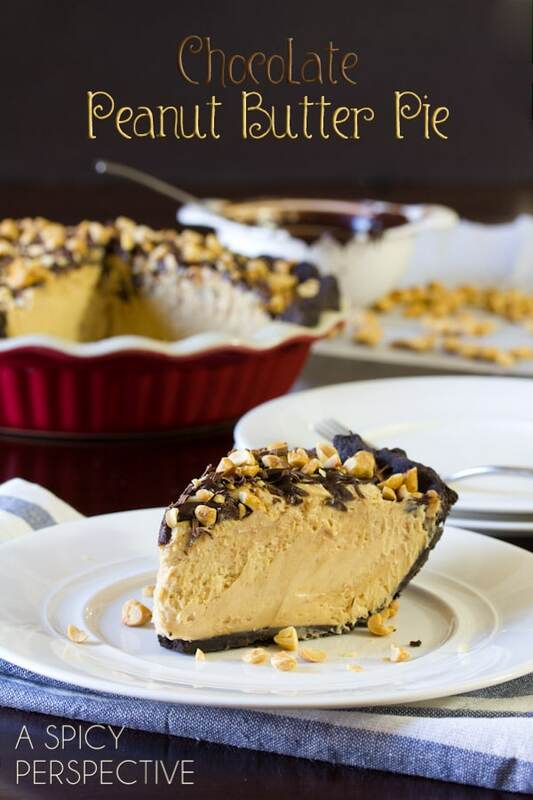 Lavish is the perfect way to describe this Chocolate Peanut Butter Pie. I can’t get over how light and fluffy the peanut butter filling looks. Incredible! Oh goodness, put a warning label on this recipe ;) it looks too good! I will n-e-v-e-r be able to make this pie. Not even for guests! They may have to put me away in rehab. Oh how I love peanut butter pie! I have been playing around with a recipe of my grandma’s the past few months. Yours looks awesome!! This is not helping my peanut butter addiction. AMAZING, Sommer! Amazing pie! Love the chocolate and peanut butter combo – it’s irresistible! It doesn’t get much better than this! That texture looks to die for! I can see why, that filling looks sinfully good! My kids would go crazy for this! This pie looks so good and easy to make too. I think I could never get tired of peanut butter and chocolate. 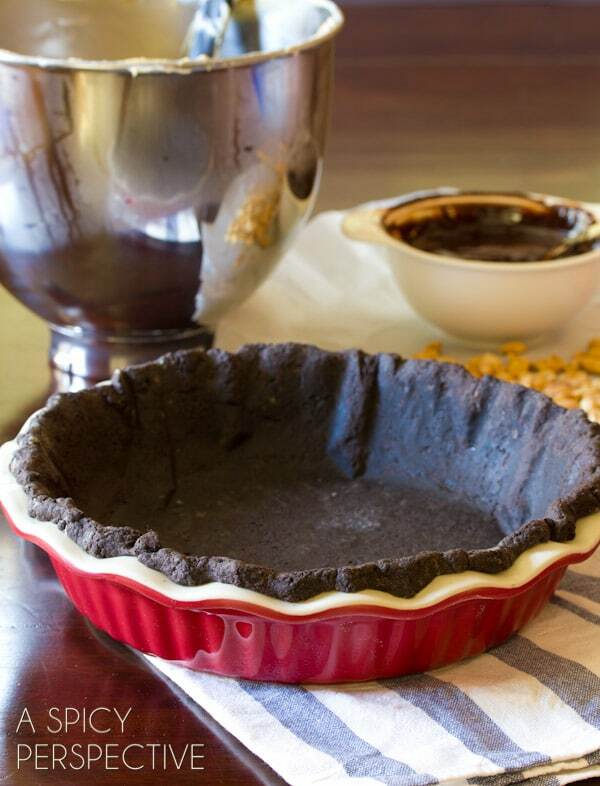 And a chocolate pie crust? What a great idea! 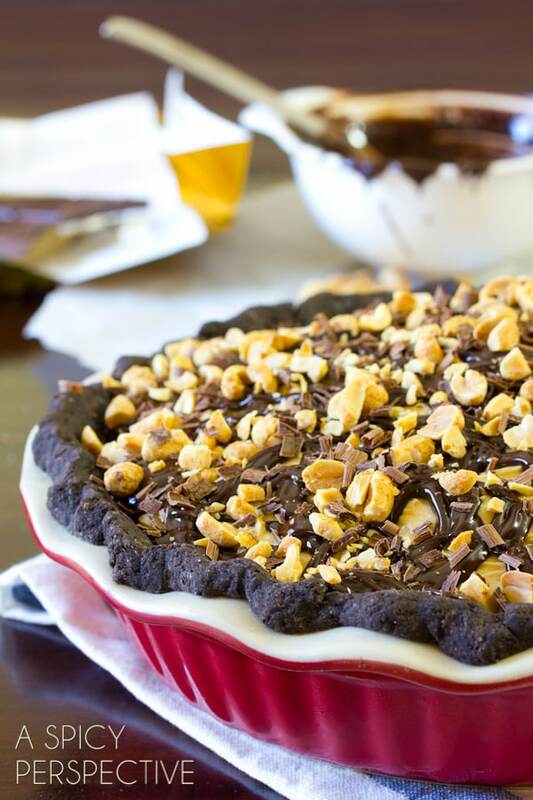 This pie looks like chocolate and PB heaven! This is all of my favorite stuff in one pie. Amazing!!! Whoa bessie! Now, this is a pie that I could have a torrid love affair with! Looks yummy. How would it be frozen? A decadent and perfect looking pie. Oh WOW! This look so amazing! I am totally willing to risk everything and take this pie off of your hands. It’s gorgeous! Woooow you got me wanting to lick the screen! What’s not to love about this pie. Gorgeous! beautiful and decadent! i love how tall it is!! Oh, hello you beautiful pie!!! Wanna meet, face to face, with me?!? ;-D Sommer, this pie is GAWDGEOUS! Right? That’s exactly how I feel. Oh what a decadent & fabulous looking pie! I can see why you feel this way…..holy moly, Sommer, looks incredible. Knowing my current love with peanut butter, I think I’d eat all of this in one sitting. This beautiful pie would satisfy any sweet tooth! This is one incredible pie! 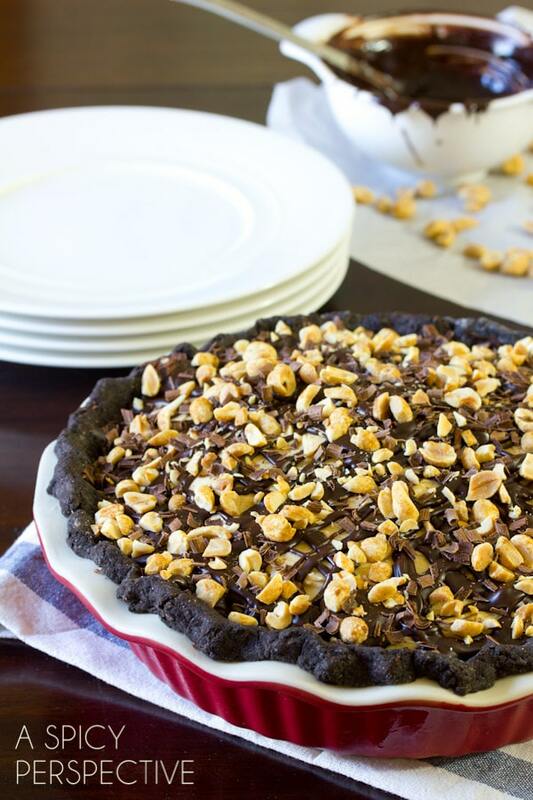 Chocolate and peanut butter together is one of our favorite combos over here, but I have yet to make a pie like this. It is so being added to my list! 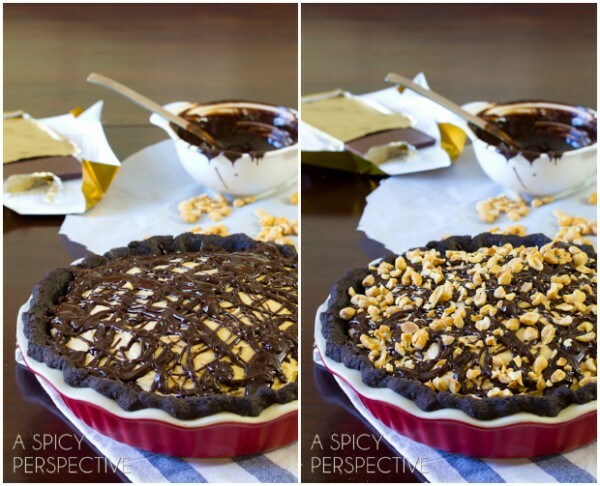 It is kind of show stopping and the perfect chocolate pie for Thanksgiving!